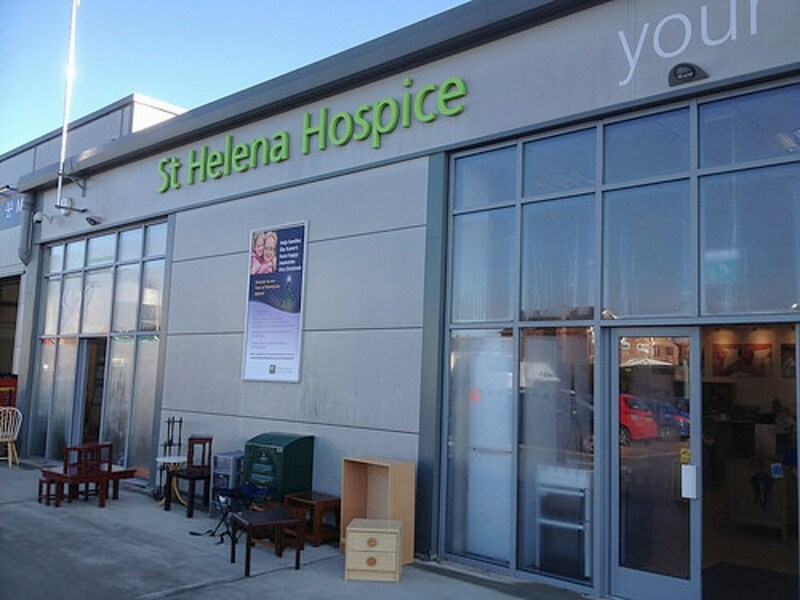 On the 18th July it was week 2 of volunteering at the St Helena Hospice donation centre in Stanway, Colchester. 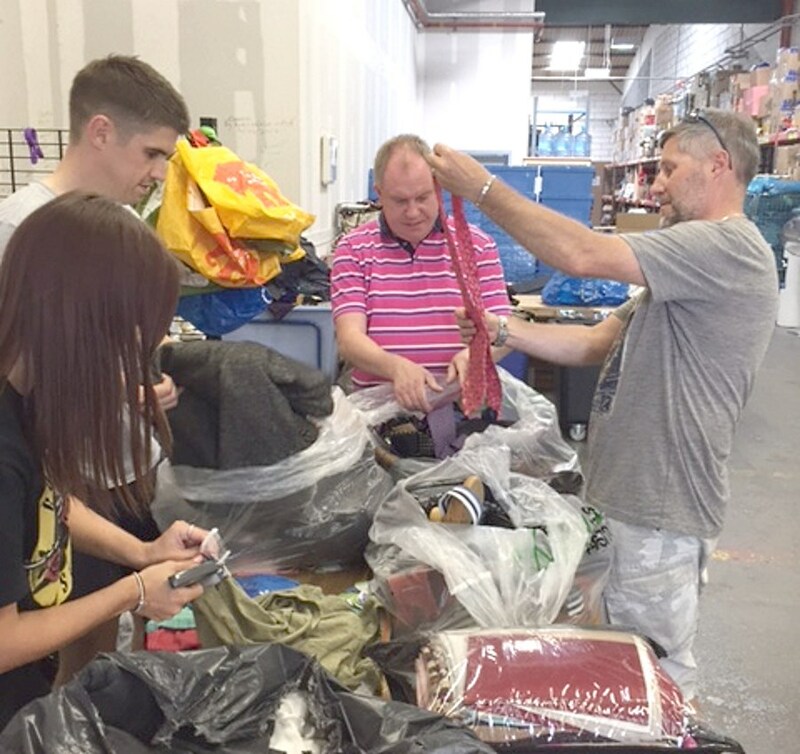 A second team of nine willing helpers from Codair Design & Publicity arrived to check, sort and categorise items donated to the charity. 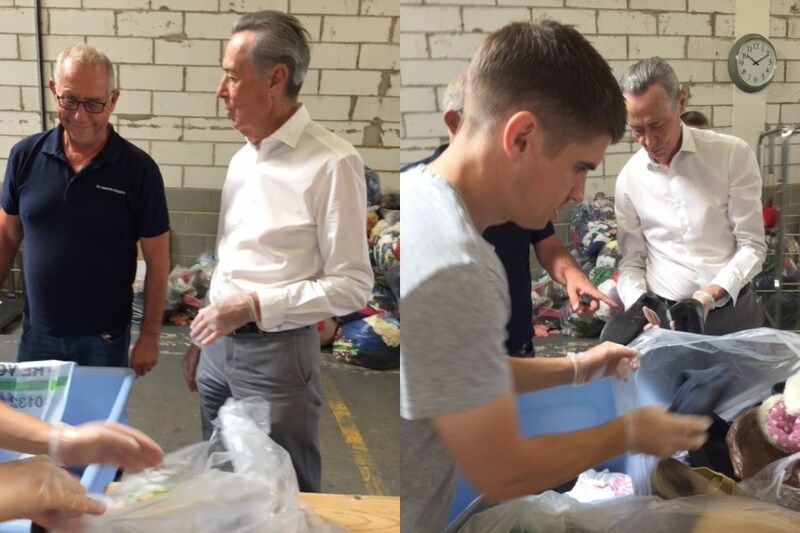 After a look around the packed warehouse next to the charity’s furniture showroom, our volunteers were put to work by Nick and Dave from the Hospice Donations Centre staff. Terry surveys a cabinet full of the many games donated. We wonder what one he was looking for? 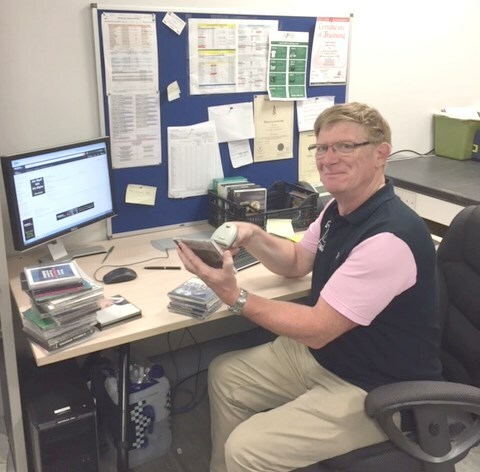 Bob King and Terry Knight began sorting through the many games the charity receive whilst John Cottee began checking the barcodes on all the DVDs to see if there were any rare discs. These would be auctioned on the St Helena Hospice EBay shop. John scans the barcode on yet another DVD. Looks like it may have been a rare one. In the foreground, Amber tags a Gift Aid item while the boys discuss the merits of a donated tie. Amber Callaghan and Andy Mackay worked together sorting the Gift Aid items. This involved adding tags to each one as they went to enable the Hospice to maximise the return on these items when sold in either one of the Hospice’s 17 retail shops. 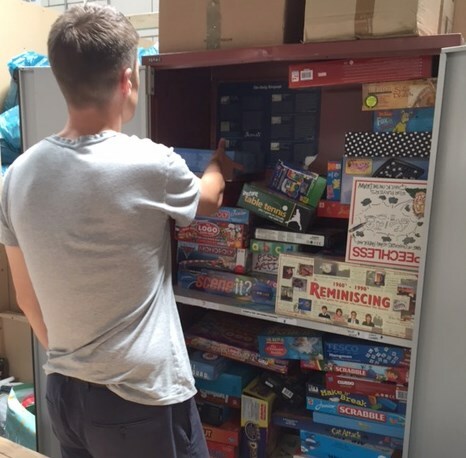 David Wilson and Tony Padbury took on the task of sorting and checking through toys and bric-a-brac. They appeared to enjoy this, particularly with regard to the toys. Boys and their toys. It looks as though David and Tony wanted to go out and play. That just left the sacks of donated clothing, shoes and handbags. Mandy Cant and Jodi Meadows delved into these enthusiastically looking for any pre-loved designer items as they went. New items with their labels still attached or in their original wrapping or with designer labels are sent to the Hospice’s specialist team for further assessment and possibly, considered for online auction. In one pair of trousers Jodi was most surprised to find a £10 note – instant cash for the charity! It was just too exciting for Jodi. The whole day just went to her head – twice! 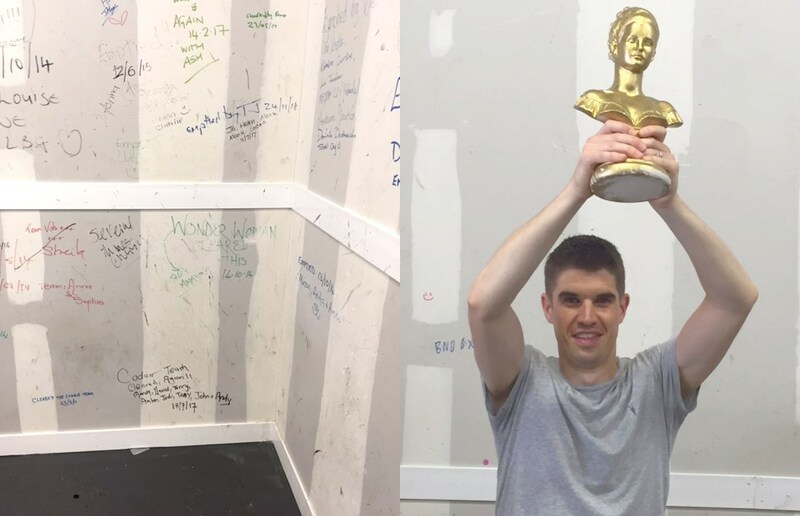 As it had been the week before, the day was a huge success. Again, the team managed to clear all the bags of donations and were asked to sign the wall. And so, another team from Codair left at the end of the day happy and satisfied in the knowledge they had done all they could to help St Helena Hospice. We clear the donations again. Fantastic! Terry’s face says it all. Is that a bust of St Helena? Mandy, Terry and everyone from Codair who went along to the donations centre over the two weeks had a great time helping and would like to thank St Helena Hospice for the opportunity of doing so. Could your company send a team to help? If so, contact Chloé Winter at the Hospice. You can email her here.